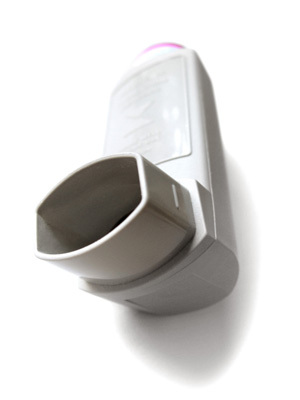 The Aerovance company reports good test results from two clinical trials with a new asthma drug, although some doctors are apparently skeptical. Called a pitrakinra, the drug is a cytokine blocker. These kinds of drugs have been tried in the past, but the new one is different because it blocks two cytokines associated with asthma, while the older versions blocked only one. According to the company, twenty years of research back the development of the drug and years of trials will take place before/if it ever hits the market in inhaled form. You know, I read all the time about new clinical trials, new research, and new theories about asthma. It’s easy to get excited about a pharmaceutical that seems like it might offer real hope, but I know the reality is that for any chronic illness/disease/disorder, new advances and meds are few and far between. If this one works, though, I could see how it would change the lives for thousands (tens of thousands?) of families. Researchers say the medicine would help asthmatics who don’t respond well to corticosteroid maintenance, and I honestly can’t picture my life if my kid were one of those unfortunates. Steady Flovent use changed Asthma Girl’s life, and mine as a result. I used to have an online friend on one of the older asthma message boards, and her preschooler used the highest dosages for all his meds without attaining good control. Stuff like this drug seems tailor-made for kids like him. I hope it works. I hope, I hope, I hope. I’m a big fan of all research into alternative medications (meaning ones targeting the different cellular components or chemical mediators that are behind the inflammation), to help those of us stuck on either high doses of ICS and/or pred. Targeting cytokines is a good idea. I’ve done some journal article searches on the chemical mediators of airway inflammation recently (for a paper I wrote) and IL4 cropped up in several of them. If you look at the types of meds we have now, they all target 1) mast cells (Intal) 2) Leukotirines (singulair, accolate) 3) Theophylline works on several different things including histones (DNA). And then there are the corticosteroids that do a bunch of different cellular components. Nothing specifically for eosinophils (although ICS and Methyxanthines work some on them). Immunology is the feild of research I want to go into after I get my DVM/PhD.. so sorry if I rambled. Anyway, I hope new meds they come out with are cheaper (although, its a fat chance). I haven’t even gone as far as to get my IgE level tested to see if I qualify for Xolair because I couldn’t afford if I did. 1,000-2,000 a month is out of my range, espeically since if I had to pay for all the meds I take I’d be shelling out $700+ a month. Hey, you can always ramble here–I appreciate the extra information, especially from a scientific background. My standpoint is that all research is good news, if we can get more information/treatments/pieces of the asthma puzzle. And yeah, I doubt they’d be cheaper, too. Thank God for health insurance, although even the co-pays can be steep.